The project reconnects the hydrologic cycle by infiltrating clean water back into the ground. Water from sinks and showers is stored in a greywater tank and cleaned in a constructed wetland, which can filter 500 gallons per day. 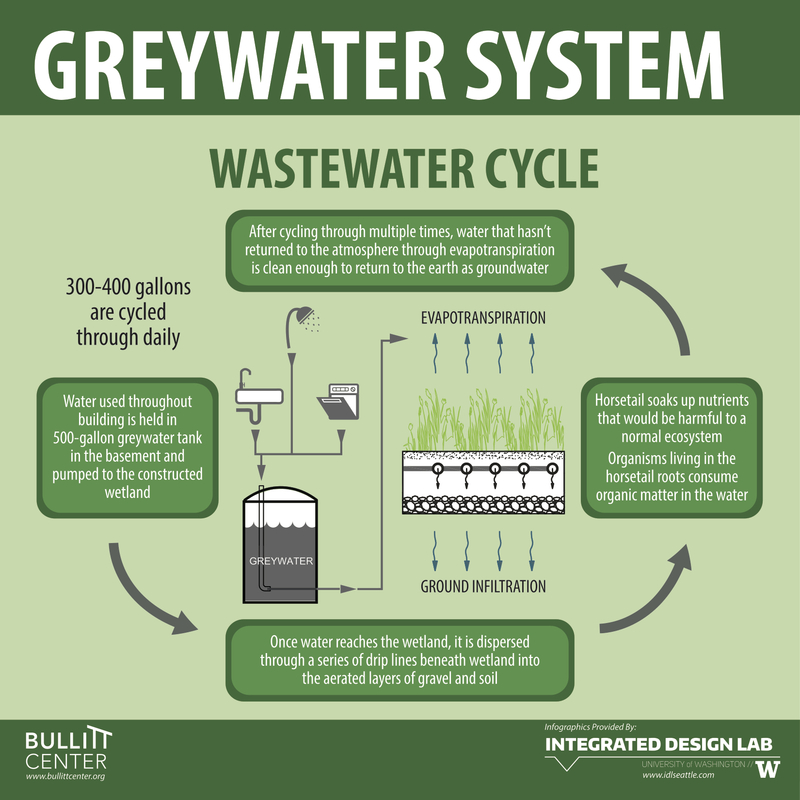 Clean greywater is infiltrated back into the soil to recharge the local aquifer. Denis Hayes, the leader behind the Bullitt Center, often compares the building to the Douglas fir forest that once covered the site before settlement by Europeans. With respect to water, the forest would retain, metabolize, and then slowly release the water that falls on its site. 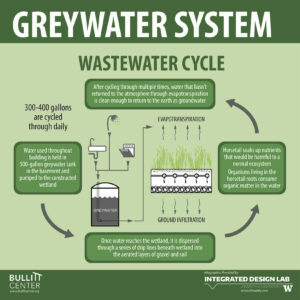 Restoring this historical relationship with the site’s water cycle is the job of the Bullitt Center’s greywater treatment system. Water and biodegradable soap used in the taps and showers drains into a 500-gallon storage tank in the basement of the building. From here, 500 gallons-per-day can be pumped up to the third-floor constructed wetland. The constructed wetland is a green roof that has been filled with layers of porous gravels and soils. (Image of Equisetum) Horsetails, or equisetum, are used as the primary plant for their hardiness and ability to thrive in Seattle’s climate. The water is pumped through a series of drip lines so that the plants can absorb the nutrients. It is then collected and pumped through the system several more times until the nutrients have been absorbed and it is safe to release in the bio-swales along the western edge of the site. In the bio-swales, the water filters down through 20 feet of gravel before it is deposited into the water table. Functioning similar to the Douglas fir forest, this catch and slow release of water allows the Bullitt Center to restore 61% of the water to the ecosystem either through ground infiltration or evaporation, and mitigate stormwater during and after rain events.